Despite the importance of safety training to reducing company and employee liabilities, many companies do not have the educational resources necessary to identify and address knowledge gaps in employee safety awareness. In this post, we’ll examine the importance of employee safety training to OSHA compliance and reveal the easiest way to implement a high-quality safety training program. Employers with hazardous chemicals in the workplace must develop and implement a written hazard communication program and train employees on the hazards they are exposed to and proper precautions (and a copy of safety data sheets must be readily available). Communicating workplace safety standards in “a language and vocabulary that workers can understand” speaks to the quality and format of your employee safety training, not just the content. To comply with the OSHA directive, you’ll need a reliable process to assess and document your employees’ understanding of safety compliance guidelines as well as a method to determine their ability to apply that knowledge to real-world situations. OSHA also requires that you have a hazard communication program in place to train your workers on any risks connected with potentially dangerous chemicals that they may be exposed to. Program implies a formal structure—an established approach to addressing chemical hazard risk avoidance issues, along with a system to evaluate your employees’ level of comprehension of workplace safety. Translation? If your employees could potentially encounter hazardous chemicals on the job, then distributing multilingual data sheets on safety risks may not be enough to ensure your compliance with OSHA regulations. Insufficient or inconsistent employee safety training influences the rates of employee non-compliance with critical safety standards. A lack of proper safety training often fosters a culture of noncompliance which heightens workplace risk exponentially as the company’s workforce grows. Poorly trained employees can ultimately impact long-term productivity, as organization-wide efforts to mitigate risks places a strain on human resources. As an organization grows, poor safety standards compliance contributes to a culture of noncompliance that may increase company risk over time. So how do you transform your employee safety training approach? First, let’s get a quick overview of OSHA’s employee hazard training directives. OSHA provides extensive documentation on how to maintain compliance with its directives. Here, we’ve compiled a “cheat sheet” for establishing or maintaining a compliant employee safety training program and going beyond OSHA’s requirements to optimize employee safety training and compliance performance. Employee safety training should be equally accessible to workers of all educational backgrounds. Self-directed learning is an excellent option for presenting critical material in a way that optimizes individual learning styles to increase the impact of each educational experience. Through online, interactive learning via an LMS, employee safety training may include multimedia components such as video, self-paced quizzes, live streamed virtual lessons, and social learning via secured virtual classrooms—all instructional methodologies that recent research suggests may help learners who struggle with complex concepts to acquire and retain information more easily. The use of a tested educational quality control process is essential to improving employee safety training. When your employees are failing to grasp core safety compliance principles, an LMS with historical learner performance data can help you determine if only a handful of students are struggling because of individual learning style conflicts, or if the design of the training curriculum itself is problematic for numerous employees. If you are using the WestNet LMS, you can quickly update curriculum components in response to a change in your employees’ educational requirements. If you’re using an LMS, here are some simple ways to enhance your compliance efforts with the OSHA mandates. Use the flexibility of your LMS to introduce multimedia elements to promote awareness of your safety program. Example: Solicit employee-created videos that present frequently asked safety and compliance questions. Use the LMS media streaming option to present direct responses to newly submitted questions during live virtual classroom sessions. Take advantage of the social learning component of your LMS to create a virtual classroom for management and management that promotes discussing and collaborative learning. Example: Use the secure download option on your LMS to share a specific eBook that can be downloaded by an employee from a designated screen during a learning activity, designed to coincide with a specific right or wrong response on a learner assessment. Create customized online courses that are geared towards your employees’ competency levels and knowledge gaps. Enhance existing lessons with learning tools—such as video—that have been shown by researchers to improve knowledge retention. Example: Use your LMS’ versatility to your advantage and create a library of helpful videos that learners can access when they have more questions about a challenging topic. First step, assess learner performance. If your employees are struggling to answer questions on basic safety compliance, then you’ll need to institute an educational intervention that optimizes employee time and gets rapid, demonstrable results. The easiest way to launch and monitor an employee training intervention is to use an online learning platform that allows for real-time monitoring of assessments and learner activity. Second, update safety training content that has failed to engage your learners. Since timing is critical in responding to your employee’s safety compliance knowledge gaps, use an online learning service if you do not have the resources to redesign your curriculum in a timely fashion. Your LMS should allow you to quickly add components—such as video or virtual classrooms—that can improve your employees’ learning experience. Third—get a robust employee safety training LMS. The easiest way to limit avoidable employee risk is to make certain that your workers have all of the information that they need to make smart safety compliance choices. The simplest way to assess and optimize worker educational experiences is to do so from a single platform—a feature-rich LMS. WestNet Learning is a cost-efficient LMS service, specifically designed for business training, safety, and management needs since 1996. 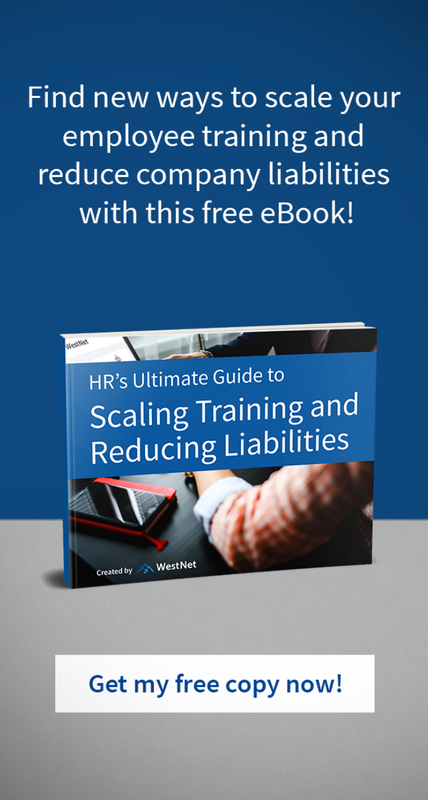 No matter the size of the company, WestNet Learning provides an easy-to-use platform, utilizing the latest technology for Human Resource professionals that strive to ensure their employees safety and prevent company liabilities. If you would like to learn more safety tips, or more about how an LMS could help you improve safety training, schedule a 1-on-1 strategy discussion today.